New Wave 80s Europop - Swedish/American style. Think Yaz with a male singer. Comprised of keyboardist/composer Lars Wallden (of AvantGarde fame) and singer/songwriter davidmahr (Only You, Lost & Found). 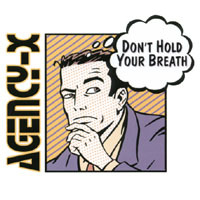 Agency-X came into being after a mutual DJ friend introduced synthpop singer/ songwriter davidmahr to Swedish keyboardist/composer Lars Wallden (of the popular Swedish synthpop band AvantGarde) via the Internet. After exchanging many emails and instant messages between San Francisco and Karlshamn about their common musical interests, the two wrote and recorded a demo of what would later become their first single. Delicious Records will release their full-length debut, Mission Impossible, on May 20, 2003.